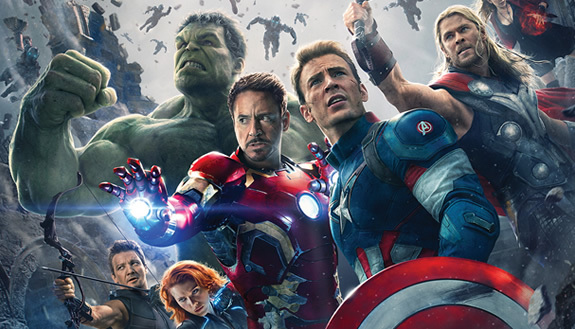 It’s not that Joss Whedon’s Avengers: Age of Ultron isn’t an enticing blockbuster movie. It is, mostly, and I really liked it and so will you. On the surface, it’s another glorious comic book spectacle that fully delivers on its few promises. For a second time, you get to see our beloved team of charismatic heroes having a great time together. You‘ll love seeing them bonding, quipping, and fighting both each other and a new threat to save the world. If you like these guys, there’s much to enjoy and your kids will be talking about this for weeks. But if you look closer and compare it to the other Marvel Cinematic Universe movies, and if you look ahead at what’s still to come, this newest entry brings up many questions. Mainly: Is this really the best they could do? Because it doesn’t feel like it. It’s not a disappointment, but there’s room to nitpick over some of the details. Let’s begin directly with the main conflict. Plagued by a Scarlet Witch induced vision of an even more devastating alien invasion, Tony’s interest in building an undefeatable security system is bigger than ever. Working on Loki’s scepter recovered from a Hydra outpost, he and Banner discover a dormant artificial intelligence with a complexity that makes his super computer JARVIS look like Simple Jack. Knowing fully well that the other Avengers wouldn’t ever approve on something as dangerous as this, Tony and Banner foolishly hijack the alien system in secret to use its potential. This creates Ultron who only takes about twenty seconds or so to turn his programmed directive of serving the Avengers into killing everyone on this planet. Great job, brightest minds of the planet. The fact that the Avengers themselves craft an enemy capable of eradicating mankind should have major ramifications for everyone. It should shake the unbreakable confidence of Stark, possibly giving him an J. Robert Oppenheimer realization, it should weaken the trust between the team members, and it should definitely change the public’s perception of their heroes. Instead, it’s all played down. The public never gets to know who’s responsible for that maniac and there are only forgettable internal arguments. Soon they’re back to witty oneliners. Whedon doesn’t even use it to establish Tony’s and Cap’s upcoming feud in Captain America: Civil War. At the end of this movie, the two of them are still friends and fine with each other. Also, there’s seemingly never pressure to stop Ultron. They’re a little bummed out that he kinda defeats them during a first bout, but even though he’s actively trying to get the codes for nuclear weapons, they really take their time to talk, eat, nap and repair tractors like it’s just another Sunday on the farm. And it’s not like they’re injured. The Marvel movies aren’t exactly showcases for gripping thrill, and frankly, they don’t have to, but almost all of the them did a fine job on raising the stakes. Whedon puts the whole world at risk, but not the characters we care for. Whedon’s handling of the team isn’t as good as it once was. The Avengers are always fun to watch whenever they throw motorcycles into cars or do tag team combo moves, or when they banter and mock each other, but outside the noisy battlefields Whedon hasn’t much to tell. You may have read that Black Widow and Banner are lovers in this, but that isn’t exactly true. They’re on the brink of becoming a pair. Strangely, Whedon completely skips over the moment Widow falls for him. The moment the movie starts, she’s already in love with him. Whedon adds a lot of scenes to show why they’re a good fit, but the most interesting thing happened before the movie even began. The same goes for Stark. Iron Man Three ended with Tony destroying his army and distancing himself from the Iron Man suit. Here, he has a new bunch of droids from the get go and behaves as if the Extremis era never actually happened. Again, Downey jr. is highly entertaining every minute he’s on screen, but it really seems as if they didn’t use the potential for great character development. While the roles of Tony and Cap are heavily reduced to mostly action scenes, Thor gets to have a questionable side quest. Scarlet Witch has the ability to screw with their thoughts. She reminds Widow of her harsh past (which involves Julie Delpy in a blink-or-you’ll-miss-it cameo), she enhances Tony’s fear of aliens, but Thor she offers some sort of prophecy. Feeling there might be something important to discover, Thor goes off to swim in a cave filled with magic water. There, he gets to explore said prophecy more clearly – and it has barely any significance for this movie’s plot because the information collected doesn’t seem that important. Maybe it gets picked up again in the upcoming Thor: Ragnarok, but here it’s mostly an opportunity to show a shirtless Thor and to have cameos by Heimdall and Selvig. However, Thor gets many funny lines throughout the movie and there’s a fantastic scene involving Mjolnir that may be the best of the flick. It has been written that Hawkeye gets to be the center of this, but I can’t really agree with that. It’s true that his screen time has been dramatically increased, and we do learn a lot about his cute life outside the job, but most of it feels like scenes that could have been trimmed down a little. Jeremy Renner is a great guy, but we’re reminded why other characters are headlining these movies. Elizabeth Olsen and Aaron Taylor-Johnson are fine additions to the cast. While his Quicksilver never gets to have a single show stopping moment like the one in X-Men: Days of Future Past, his super speed at least is used in entertaining ways. Due to her powers, Scarlet Witch gets way more to do and Olsen does a good at selling telekinesis as a cool power, but her character doesn’t have that much going for her. She’s pretty and gets to put on a cute Eastern European accent, and she’s close to her brother, but she barely speaks to anyone else. As for War Machine, Falcon, Maria Hill and Nick Fury? Glorified extras. 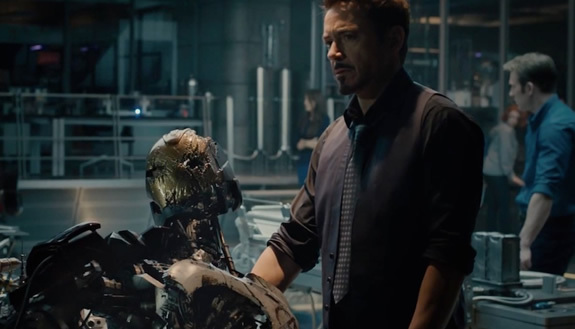 There’s a scene late in the movie in which War Machine is finally allowed to do something of relevance, but then Iron Man instantly joins him doing the same while also planning Ultron’s downfall on the side, making War Machine quickly insignificant again. Poor Don Cheadle. The biggest surprise might be that Ultron isn’t a good antagonist in the film. He’s quite odd — a self-absorbed, quipping bullshitter constantly talking about philosophical topics like existence, but it’s all hilarious nonsense. We never get to understand why exactly he wants to kill everybody. Transformers villains have had deeper motivations. Although towering over everyone and later sporting an armor made of the seemingly indestructible Vibranium, he’s not even an imposing threat. Everytime he shoots beams at our heroes, they’re only thrown away. When they kill him, and it does happen a few times, his conscience just enters another robotic body. The way they deal with that isn’t the most convincing. His own Frankenstein creation, Vision (played by Paul Bettany and dressed like an amazingly gifted Pride Parade member), is a mysterious character as well. It’s strange to see him interact with enemies, and even more when he inexplicably waits to interact with his godlike powers. You’ll either see him as completely fascinating or as just odd. In case you’re a Black Panther nut, you’ll enjoy to see the origin of one of his arch enemies. Andy Serkis, all smudgy and looking badass as hell, shows up as arms dealer Ulysses Klaw. As for the action in general? There’s an amazing attack on a Hydra hideout early on that’s just awesome. 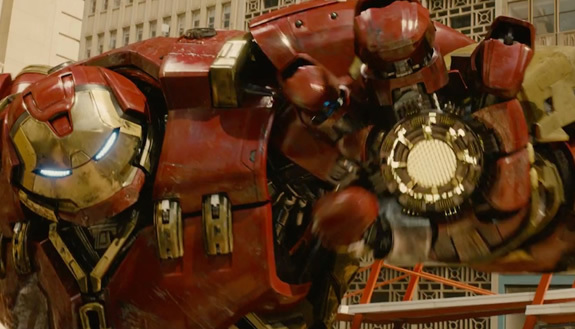 The Hulk vs. Hulkbuster sequence is fun, but has little emotional bearing and goes on a little too long. The showdown has a whole city elevated into the sky, but yeah, most of the time it’s just Avengers punching, shooting or tearing apart faceless Ultron copies or his army of drones. Will they keep doing that for every Avengers movie? It’s obviously the best way to showcase all of their powers, but there’s probably ways to make it even more entertaining. Whedon has dozens of scenes of Avengers caring for and rescuing civilians to spite Man of Steel. The massive destruction at play makes it unlikely that no civilians get hurt, but showing the Avengers rescue so many is a great way to prove their worth as heroes. The credits show the Avengers as proud marble statues chiseled in the fashion of Greek Gods, and they definitely earned that recognition. If you have the chance, see it in 2D. All of Tony’s HUD scenes, Tony’s nightmare and Wanda’s telekinesis scenes look fine in 3D, but there’s a lot of shaky cam, stressing your eyes out. The movie’s pacing is quite off, too. It often feels as uneven as the first fifteen minutes of the first Avengers movie. Many scenes drag, there are not many single “Puny god!” moments, and while tonally a lot more somber than the previous one, this is no way darker in content. It’s still a joyful experience, but you get the notion that they could have used a little more prep time on this. While many, many scenes and sequences are highly entertaining and the charismatic cast distracts from both the story and pacing problems, it’s quite an exhausting experience as well. Wait! Don’t get me wrong, I’m not saying it’s a bad movie. It’s far from that. It’s still good enough to warrant a ticket and you’ll like and even love lots of it. I’m mostly just splitting hairs on this. Given everything we saw already, this just doesn’t feel like the best possible outcome. It’s good, but some of the issues and bloat take away from what could have been amazing. Note (highlight to reveal): This has only a mid-credits scene attached to it, and it’s a really lame one. It doesn’t offer anything new and only underlines what will happen… six movies from now.